Madrid - Spain's footballers were on Monday expected to make a glorious home-coming, after successfully defending their European championship title and making history as the first team to record back-to-back wins in the competition. Just minutes after the side's 4-0 win against Italy in Kiev, workers had finished erecting a massive stage for a victory party next to Madrid's famed Cibeles stone fountain, depicting the goddess of nature on a chariot being hauled by lions. Captain Iker Casillas and the rest of "La Furia Roja" will then be greeted by King Juan Carlos before being hailed by fans in an open-top bus that will travel through the capital's streets. Goals from David Silva, Jordi Alba, Fernando Torres and Juan Mata on Sunday sparked wild celebrations across Spain, sweeping away the clouds of an economic crisis that has engulfed the south European nation. Spain coach Vicente Del Bosque said last week that a victory would benefit the country, which is mired in recession and recently received a $125 billion loan for its embattled banks and has seen its property market crash. "If we can do it... I believe that it will be beneficial not just for football but for the country in general," he said, changing his previous assertion to Prime Minister Mariano Roy that a win would not resolve the country's problems. "It will send some signals to the country that we are going in the right direction. And if the success can be transferred into society, that would be marvellous." Young and old revelled in Spain's unprecedented third straight international title, blaring car horns and flying the national flag in their hands, through car windows and off the back of motorbikes in a party that stretched into the night. Spain's red-and-yellow colours were everywhere: painted on faces, decorating wigs, on banners draped over fans' shoulders, wrapped around hips and hanging from balconies and outside bars. In the streets they banged drums, blared horns or just waved two-euro ($2.50) flags sold on street corners. In Madrid's Puerta del Sol, a dozen people leapt into the fountain and splashed water over scores of others dancing in joy. Tens of thousands of people had been glued to giant screens in an official fanzone outside Real Madrid's Bernabeu stadium as Spain added to their Euro 2008 and 2010 World Cup titles. Others swilled beers, cheering and gasping in bars across the nation as the match unfolded. "Today the whole country is united as one and everyone is in the Euro. And the crisis? No-one is thinking about the crisis," said 23-year-old business student Miguel Revert outside a central Madrid sports bar. Cries of "Champions, Champions," and "I am Spanish" echoed through Madrid's streets, as people poured out of bars and homes for a party that began at half-time when Spain were already 2-0 up. Spanish newspapers were quick to heap gratitude on the team, who had been accused of playing "boring" possession-based football in the tournament. "Thank you, thank you, thank you!" cried the headline on the home page of the biggest-selling sports daily Marca, above a photo of the cheering team with Casillas holding the trophy aloft. Conservative daily El Mundo's home page declared the team as "Champions of Legend" and described their victory as "Spain's masterpiece". "Football as an opiate of the people in suffocating times. Football as a metaphor of the courage of collective effort and the definitive loss of those complexes that hobble dreams," the paper said. "A handful of sportsmen without equal, moulded from a winning gene and led by a coach of firm convictions... showed in the Kiev Olympic Stadium that Spain, too, can be an example," it said. 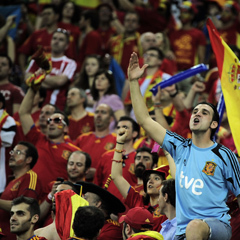 How much interest do you have in the Euro2012 championships? No interest, this is supposed to be the soccer off-season! 7% No interest, this is supposed to be the soccer off-season!